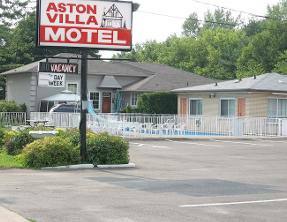 The Aston Villa Motel is located in the heart of the shopping district of Niagara Falls, Ontario Canada on Lundy’s Lane. The Canada One Factory Outlet Mall is located one block away from this motel and a wide variety of dining options are available as well. All the major attractions near the Horseshoe Falls and the surrounding area are only a short drive away from the Aston Villa Motel. This Niagara Falls Motel offers wonderful motel amenities including free wireless internet available throughout the motel, a seasonal outdoor pool, kitchenette units and a picnic area with a BBQ and play area. The guestrooms of the Aston Villa Motel provide guests with great in-room amenities.